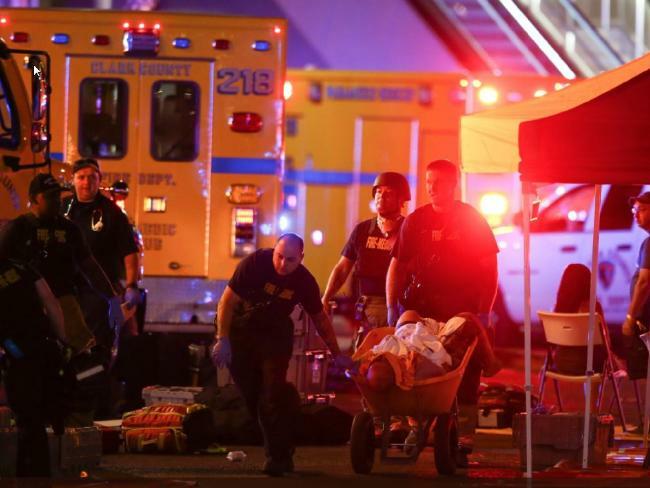 At least 50 people were killed and 200 injured were injured at a shooting that took place at a concert at the Mandalay Bay casino in Las Vegas on October 1. This horrific shooting is the deadliest in U.S. history. In the wake of this tragedy, Christian leaders have called for prayer, shared their empathy with the victims and their families, and spoken about actions to be taken to prevent such tragedies from occuring again. In terrors of hell, let an increasingly disembodied Body of Christ be embodied again: warm skin to hold, serve & weep with the traumatized. Oh Las Vegas. We are sorrowing & praying for you. Psalm 7:9 echoes from my morning reading: "Oh, let the evil of the wicked come to an end." We're sad with you Nevada. To all families and victims, we're holding you close. My heart is torn in two at the news of yet another mass shooting. Offering prayers is not enough, but it is a good place to start. The reports from Las Vegas are horrifying. Praying for the victims, the city, and for those who will minister in the aftermath. Heartbroken over Vegas. Longing for the day when God wipes away every tear and there is no more death. Struck by how every mass shooting forces us to revisit the trauma of Sandy Hook & the failure of moral will our acceptance of it represents. Join us, as well as these Christian leaders, in praying for Las Vegas.